Recently, Facebook introduced ‘Facebook Offers’ for page owners. 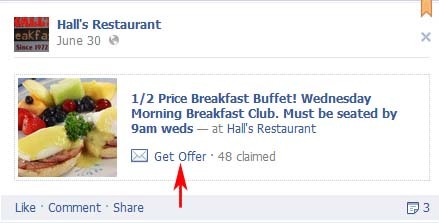 This allows businesses to create special offers and then post them to their Facebook page. All users have to do is click ‘Get Offer,’ and they will be emailed the details on how to claim it. One thing you should be aware of is that as soon as you click the ‘Get Offer’ link, your name and email address is immediately shared with the Facebook page conducting the offer. Personally, I think it would be better if you received a notification that your information is going to be shared, and then given the option to proceed. It doesn’t take too much imagination to see how this procedure is ripe for abuse, and a police department in Ohio was targeted in just such a way. 700 Facebook users received a bogus offer in just a two hour period. The offer directed people to go to the City of Cuyahoga Falls Police Department to claim the special offer. It is unclear from the article if the fraudulent offer was somehow posted to the Facebook page of the P.D., but a Facebook notification was circulated to local citizens. Nevertheless, the ruse does demonstrate how Facebook Offers can be abused by scammers to obtain a list of user names and emails. Verify that the offer is legitimate. Visit the Facebook page directly or call the organization conducting the promotion. Realize that by claiming the offer you are giving your name and email address to the Facebook page conducting the offer. Aggressive and unscrupulous companies could spam you with other promotions or even sell your information to third parties. Even worse, scammers conducting phony pages and offers could try to hack your email or target you with other socially engineered attacks.